Earlier this year, I was invited to an absinthe tasting at Peche in Austin where I learned a little about the spirit and the different brands and varieties that are available. We were served two absinthe drips which are nothing more than absinthe in a glass over which a sugar cube has been placed in a spoon so that water can be slowly poured over the sugar cube into the glass. The first was made with Pernod and the second with St. George absinthe. I learned that St. George has much more herbal flavor while Pernod tastes more of anise. I also learned that thujone, the substance which years ago was incorrectly thought to be dangerous in absinthe, naturally exists in higher concentration in rosemary than it does in wormwood which is one of the many ingredients in absinthe. I was intrigued by what I learned that evening, but I hadn't gotten around to adding absinthe to my home liquor cabinet until I received a review copy of the new book Absinthe Cocktails by Kate Simon. It's a slim book that offers a quick history of absinthe, how it was banned by 1915 in the US, France, Switzerland, Holland, Belgium, and Brazil, and how it began to reappear about ten years ago returning to the US market in 2007. The book includes a chapter of the Classics which are absinthe cocktails like the absinthe drip, sazerac, waldorf, and doctor funk which is a tiki bar favorite with lime and lemon juices and grenadine. The second chapter of recipes is The New Guard, and this includes the best absinthe cocktails from current top bartenders. These updated drinks include the likes of the shiso malt sour, my oh my ty, and la lucha sigue which involves tequila, sweet vermouth, Nonino, and orange bitters. There's also a handy glossary for looking up less familiar ingredient names, and suggested substitutions are included with the definitions. With cocktails spanning simple classics to sweet or complex concoctions, this book offers something for every taste. Right away, I was curious about the tequila sazerac and wanted to find out how the flavors of tequila and absinthe mixed. To make the cocktail which is in the photo above, a glass was filled with ice and set aside to chill. 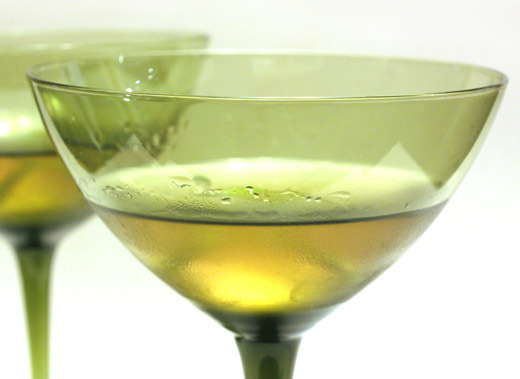 In a mixing glass, tequila, a simple syrup made with agave nectar, and Peychaud's bitters were stirred with ice. 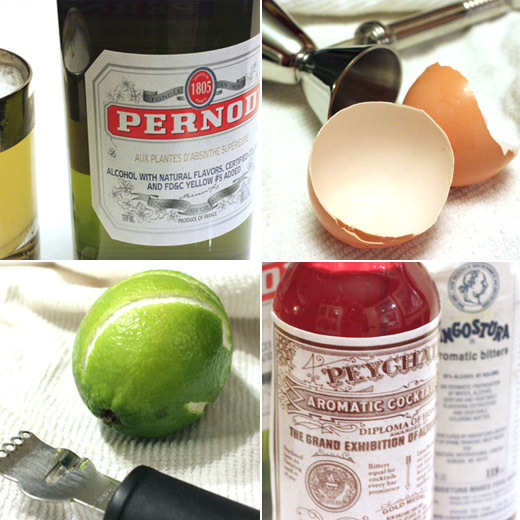 Until I shopped for this recipe, I had no idea that Peychaud's bitters were so difficult to locate. I heard from several people that the easiest thing to do is to bring some home when you visit New Orleans. Had I only known that the last time I was in New Orleans, I would have brought home several bottles. After a few calls, I finally located some at a downtown liquor store, and I was ready to stir and sip. Once the cocktail was well mixed in the ice, the ice in the glass was discarded, and just enough absinthe was poured into the chilled glass to coat it. The interesting thing about these cocktails is that very little absinthe is used, but the flavor is always prominent. The tequila mixture was strained into the coated glass, and lime peel was twisted over the top and added as a garnish. This was a strong, sipping kind of cocktail, and the tequila and absinthe married nicely. Peychaud's bitters accented the licorice flavor well. 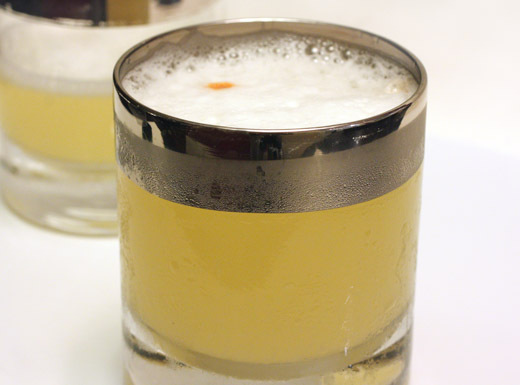 Next, I turned back to the Classics chapter for the morning glory fizz, and that is shown in the photo below. This was a shaken cocktail with scotch, lemon juice, simple syrup, a scant quarter teaspoon of absinthe, and an egg white. After shaking with ice to chill and froth, soda water was added. Once in a chilled glass, a dash of Angostura bitters was dropped on top. This was a tart and tasty drink, and that small amount of absinthe added nice herbal and anise flavor with the dash of bitters preventing the drink from being too sweet. It was interesting to taste how absinthe mixed so well with different ingredients, and I'm looking forward to trying several more combinations, both classic and new, from the book. Barbara Lynch, What Are You Reading? About a year ago, I brought home a copy of Stir: Mixing It Up in the Italian Tradition and have enjoyed cooking several meals from it since then. That book is by James Beard Award-winner Chef Barbara Lynch of Boston. 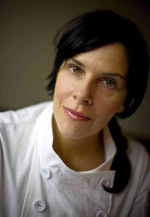 Her early experience included working with some of Boston’s other great chefs such as Todd English, traveling in Italy, and being named one of Food and Wine’s Best New Chefs in America. Since 1998, Barbara has operated her own Boston restaurant, No. 9 Park, and two additional restaurants, B&G Oysters and The Butcher Shop, opened in 2003. A few years later, five more businesses were opened including a catering company, a bar dedicated to craft cocktails, and Stir which is a demonstration kitchen and cookbook store. Last spring, her latest fine dining restaurant, Menton, opened in the Fort Point neighborhood. Barbara leads all of these businesses as CEO of Barbara Lynch Gruppo, and her many recognitions include being named Best Chef by Boston Magazine and No. 9 Park being named one of the Top 50 Restaurants in America by Travel and Leisure. I was curious about what books such a busy and talented chef would find interesting, so I asked her what are you reading? I adore eggs, and there is so much technique involved in perfectly cooking this everyday ingredient. In the hands of the French, eggs may be transformed into incredible dishes…from airy souffles to luscious aiolis. This book from the brilliant Chef Roux is really a must-have for any cookbook collection—it combines lessons on technique with both basic and “fancy” recipes and is a great reference for egg cookery. One of the perks of owning my own cookbook store (Stir) is getting advanced releases on some of the much anticipated books throughout the year! One of these is Blood, Bones and Butter . I love Gabrielle Hamilton, and her restaurant Prune is one of my favorites in NYC. I started reading her book and couldn’t put it down—in fact, I’ve reread it twice. Gabrielle’s writing is honest and gutsy, and it is a terrific read! This book comes out in March, and I can’t wait for others to read it. Thank you for participating, Barbara. Check back to see who answers the question next time and what other books are recommended. Can I show you one more cookie? I hope you said yes because this was my favorite cookie I baked for Christmas this year. That sounds like I'm being mean to the other cookies, but I'm really not. Of course I liked them all, but this one with the stacked doughs was a different kind of cookie. The technique got me thinking as well. If two doughs can be stacked as they are here, why not three? And, next time, I can try different flavors depending on the season or the occasion. I followed the original recipe for these from the December 1998 issue of Living magazine. I found the page in my files when I was checking to see if there was something I'd tucked away from years past that I should try. I love it when I find a gem like this hiding in my files. 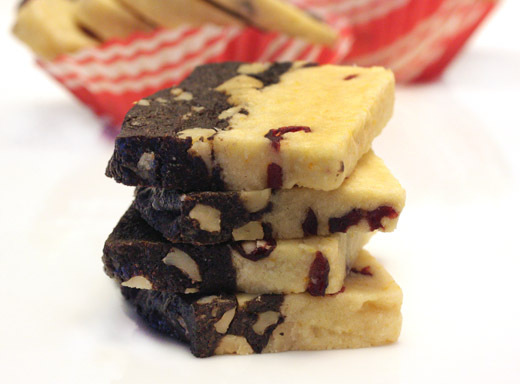 So, the two types of dough in this cookie are orange-sable dough to which dried cranberries were added and a chocolate-espresso dough to which toasted walnuts were added. I started with the orange-sable dough, and it was made with almond meal, confectioners' sugar, butter, orange zest, an egg, lemon juice, and flour. You can grind blanched almonds in a food processor or use almond meal as I did. 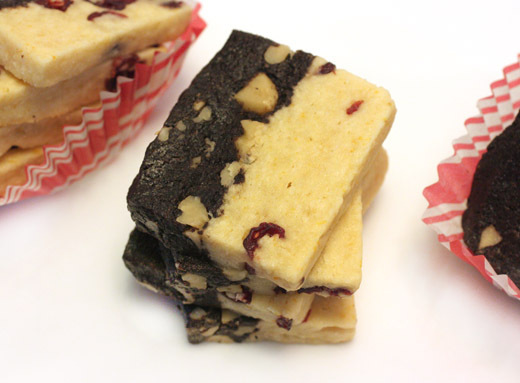 Once the dough came together, dried cranberries were stirred into it, and it was pressed into an eight-inch square pan lined with plastic wrap and set aside. Next, the chocolate-espresso dough was made with flour, Dutch-process cocoa powder, finely ground espresso, butter, confectioners' sugar, and vanilla extract. I used a mix of ordinary Dutch-process cocoa powder and some very dark and rich black onyx cocoa powder which gave the dough a deep, black color. 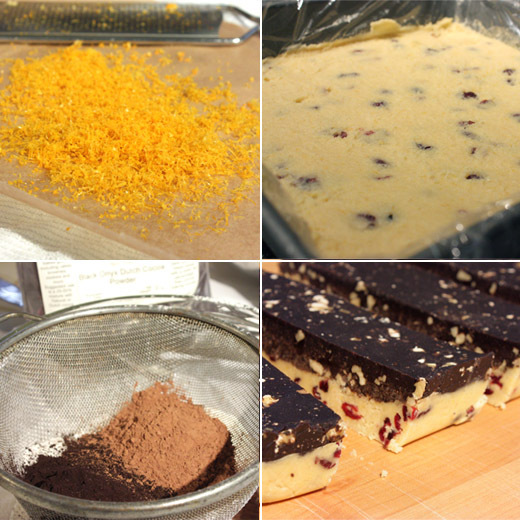 Toasted and chopped walnuts were added to the chocolate dough, and it was pressed on top of the orange-sable dough. The pan was chilled at least two hours or overnight in my case. The next day, I removed the stacked doughs, cut two-inch wide rows which were then cut into skinny, one quarter inch cookies to be baked. I liked the color contrast in each cookie, and the extra dark cocoa powder helped with that. I also liked the specks of dried cranberry adding touches of red on the orange-sable side. Mostly though, I really liked the flavors. The citrus and tart cranberry on one side and the deep chocolaty, coffee flavor with walnuts on the other was a great mix. I'm already thinking of other combinations for this technique. Maybe a third layer full of finely chopped pistachios would work, or maybe a version with layers of flavors that are a take on a banana split would be good. The possibilities are endless, and that's why this was my favorite. I hope you're all enjoying the holidays, and I wish you a very Merry Christmas. Once I stared baking from the Gourmet Cookie Book, I couldn't stop with just one cookie. As I flip back through the book again now, I don't see any cookies in it that I don't want to try. This next one I baked is the second to last cookie in the book, and it's from a 2008 issue of the magazine. 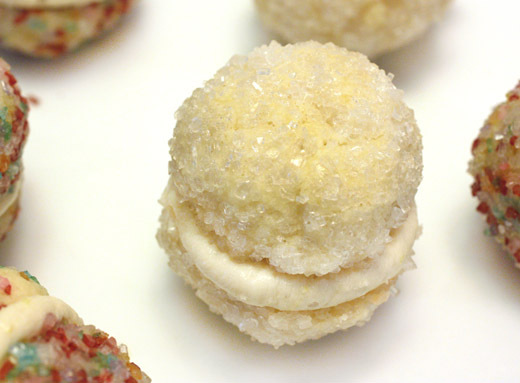 The glittery, sparkly little butter cookies sandwiched with a lemon buttercream just had to be tried. 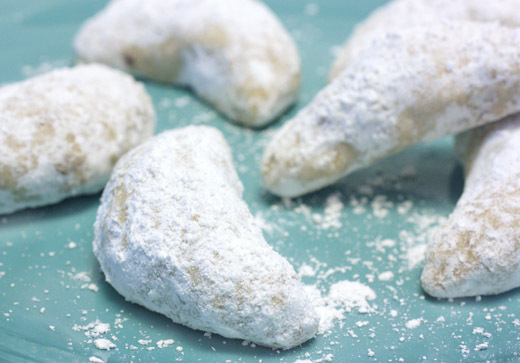 They're made with a straightforward dough with no surprises, and the hardest part of making these was rolling the dough into little balls to be coated with sanding sugar. The very next day after baking these, I found a similar recipe from which I learned that if you chill the dough for a bit, rolling it into balls is much easier. I'm set for next time. Each cookie is tiny, made with just barely a teaspoon of dough, but when they're sandwiched together they're just the right size. To start, flour, cornstarch, and salt were whisked together and set aside. Butter and confectioners' sugar were mixed until fluffy, and lemon zest and vanilla were added. The flour mixture was mixed in until the dough formed. At that point, I should have chilled the dough for at least 30 minutes. Had I done so, rolling teaspoons of it into balls and then coating them in sanding sugar would have been a breeze. Since I didn't chill the dough, I had sticky cookie dough all over my hands and repeatedly had to stop and wash my hands and start again. 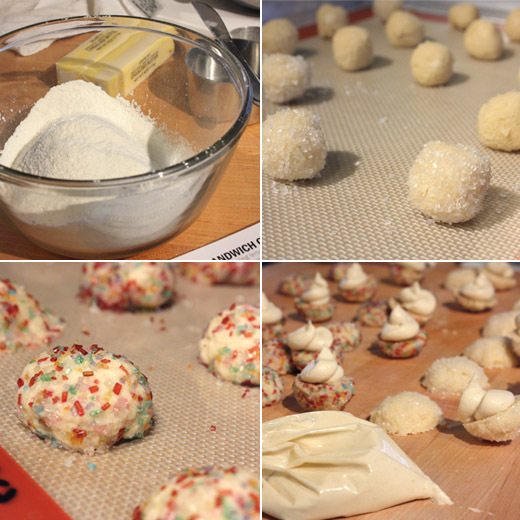 I rolled half the cookies in plain white sanding sugar and the other half in sugar in confetti colors. The sugared balls of dough were placed on baking sheets and baked for about 12 minutes. When they were cool, the filling was made with confectioners' sugar, lemon zest, lemon juice, corn syrup, and softened butter. The buttercream was placed in a plastic bag, the corner was snipped, and filling was piped onto the flat sides of half the cookies before they were paired up and sandwiched. I think these dazzling, little treats look a lot more complicated than they really are which is one reason I liked them. Another reason is that the tart lemon flavor in the smooth filling is a nice contrast with the sugary, crunchy cookie coating. They're festive and eye catching, and this is a cookie I know I'll be making for many more occasions to come. When the holiday baking season was fast approaching, I grabbed a copy of the new Gourmet Cookie Book . A couple of years ago, there was a cookie article in the magazine that offered the best cookie, as chosen by the editors, from each decade going back to the 1940s, and this book is an extension of that idea. It includes the best cookie from each and every year the magazine was published from 1941 to 2009. What I find particularly interesting about this book is that the recipes were reprinted as they were originally written, and there are notes throughout regarding how recipe writing styles have changed over the years. In some of the earliest recipes, the instructions were a little vague with suggestions to place cookies in a "moderate" oven and "add butter" with no reference to what temperature either should be. If you've baked similar cookies before, certainly you can figure out the process, but it's interesting that these days recipes leave no detail to the imagination. Just in case, the book's editors have provided updated notes on those early recipes to clear up any possible confusion. I started with one of those older recipes, from 1947 to be exact. 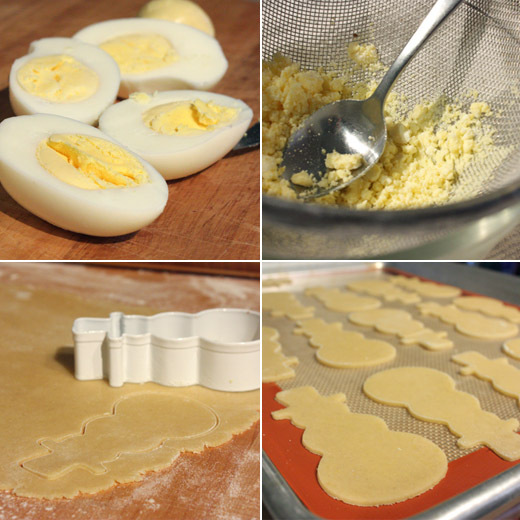 It's an old-fashioned butter cookie, and I was intrigued by this recipe's use of hard-boiled egg yolks in addition to raw yolks in the dough. I'd seen that done before on a cooking show several years ago, and I wanted to find out how that affected the texture of the cookie. So, three eggs were hard cooked, the whites weren't used here, but the yolks were pushed through a sieve and set aside. Butter and sugar were creamed, and the instructions suggest doing that by stirring. I only took the old-fashioned concept so far. I used my stand mixer. To the fluffily creamed butter and sugar, the sieved egg yolks were added alternately with sifted flour and three raw egg yolks. Last, some lemon zest was mixed into the dough. The dough was chilled before being rolled and cut into festive shapes. It was an easy dough to roll and cut, and it held its shape well. 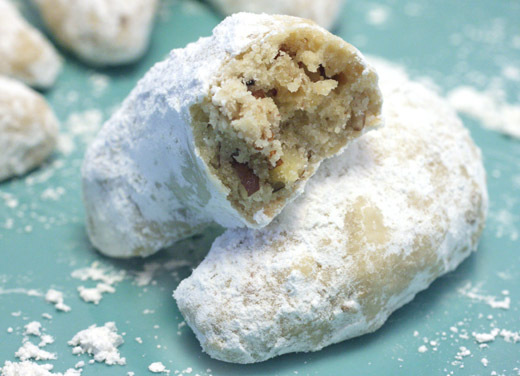 Before going into that moderate oven, which the editors noted should be 350 degrees F, the cookies were brushed with egg white and sprinkled with chopped nuts and sugar. I used roasted, salted, chopped macadamia nuts for mine. These were crunchy, crumbly, buttery cookies. They had a nice snap, and I heard that snap repeatedly as these were possibly the easiest-breaking cookies I've baked. Once I realized I needed to handle them more carefully, I started to like that snap with each bite. 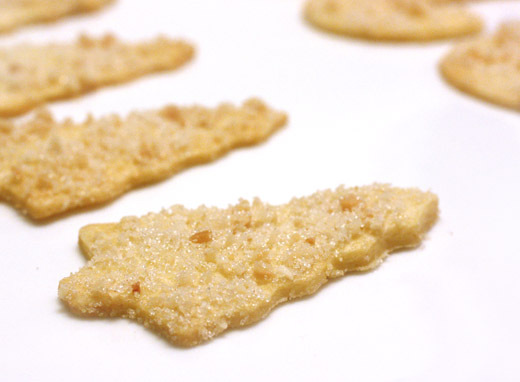 The sandy, crumbly cookie and the crunchy nutty topping made these a great treat for the holidays or any time of year. 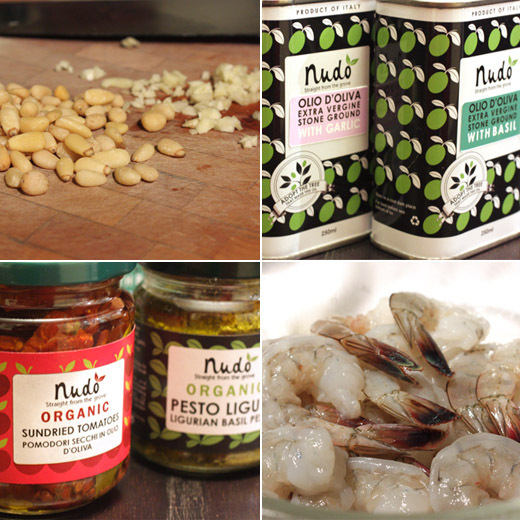 It's no secret that some of my favorite food is of the Italian variety, so when I was offered some products to sample from Nudo I happily accepted. Nudo has been in business since 2005 when the owners finished restoring an abandoned olive grove in Italy's Le Marche region. They produce small scale olive oil with traditional farming methods, and you can adopt an olive tree for a year which allows you to receive all the olive oil produced from it during that year. Nudo's extra virgin olive oils and flavored oils are combined with vinegar, pesto, pasta, and more in a range of gift baskets. My samples included both garlic and basil flavored oils, organic sun dried tomatoes, and organic basil pesto. The oils are packaged in tins which prevent light from affecting the oil, and the options they offer are extra virgin first cold press, organic extra virgin, lemon, mandarin, chili, garlic, and basil. My first idea for tasting the samples was to toast some crostini and top them with goat cheese, sun dried tomatoes, and a dollop of pesto. The mix of chewy, intense tomatoes and basil-scented pesto was great with creamy goat cheese, but I wanted to put the products to another test before mentioning them here. I decided to poach some shrimp in the garlic oil and make a pesto with the sun dried tomatoes. The two would have been fine on their own with the pesto used as a dipping sauce for the shrimp, but I tossed the pesto with some fresh pasta and topped it with the shrimp instead. For the pesto, I emptied the jar of oil-packed sun dried tomatoes into the food processor and added some chopped garlic, a handful of pine nuts, and a some of the basil oil. That was whizzed into a state of pestoness and set aside. 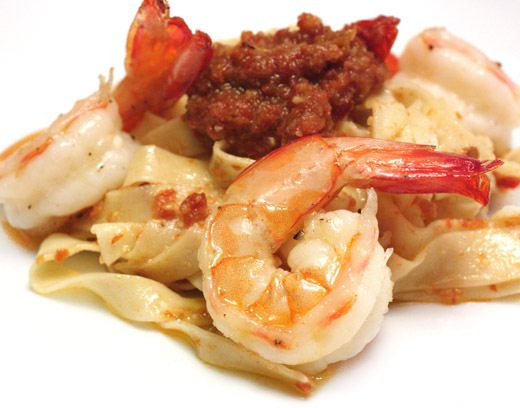 To oil poach shrimp, I used a small saucepan and enough garlic oil to mostly cover ten or twelve large shrimp. 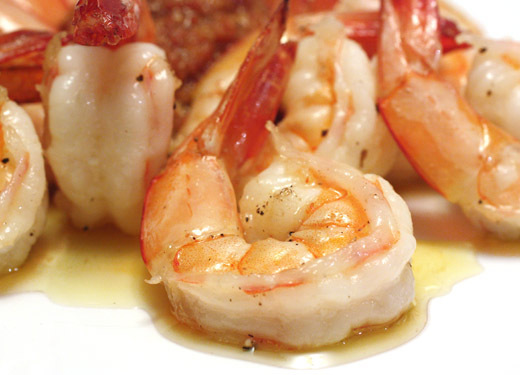 The oil was heated just to about 170 degrees F. The oil should just gently cook the shrimp rather than deep fry them. Keeping the oil around 170 will allow the shrimp to absorb the flavor while cooking over the course of about seven minutes. I had some fresh pasta in my freezer, so I cut it into wide ribbons, boiled it, and tossed it with the sun dried tomato pesto. The garlic oil poached shrimp sat on top. The garlic oil is more subtle in flavor than you might think. It flavored the shrimp just enough while poaching. I also found the garlic oil when used in a vinaigrette for salad left it with just enough garlic flavor and not too much. The plump, sun dried tomatoes made a nice pesto too. These are flavors that are meant to be together, garlic, olive oil, sun dried tomatoes, and when the quality of each thing is as good as it was here, you can't go wrong. 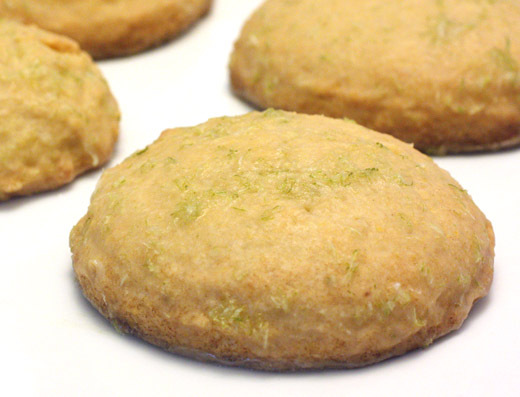 I'm always drawn to a cornmeal-lime cookie, but I'm not always happy with what I get. Some versions tend to be dry and often the lime is barely discernible. Well, I can stop trying every version that comes along, because I've found one that delivers big in texture and taste. These cookies are from the new book Flour , and I told you I'd be mentioning it frequently around here. They bake up puffed and light with a tender, almost cake-like crumb, they have great cornmeal flavor, and the lime is both noticeable and delicious. The thick glaze that's brushed onto each cookie adds a sweet, tart layer on top with bits of lime zest adding decoration. I made some of these at the recommended size of about one quarter cup of dough per cookie, and I made a some at a smaller size. The smaller sized cookies worked fine and still had the same tender texture. What I really should have done was double the recipe, and next time I definitely will. Making the cookies started with the standard creaming together of butter and sugar. Lime zest was added with eggs and vanilla followed by a whisked-together mix of flour, cornmeal, baking powder, and salt. As I mentioned, the cookies were formed from one quarter cup scoops of dough, and the scoops were slightly flattened with the palm of my hand. Do you use an ice cream scoop for placing cookie dough on baking sheets? I started doing that years ago, and I use scoops for muffins too. Some scoops break easily or the sliding arm that glides through the scoop seems to constantly pop out of its track. If you've ever had that problem, I may have the solution for you. Food scoops work better than ice cream scoops, and they come in all different sizes. I used the 2.07 ounce scoop here. The large cookies baked for about 25 minutes, and the slightly smaller ones I made baked for about 20 minutes. The glaze was made with confectioners' sugar, water, fresh lime juice, and lime zest. Once the cookies were cool, the glaze was brushed onto the tops, and they were left to dry. I noticed a look of surprise that came upon each person who tasted these cookies, and they surprised me too. 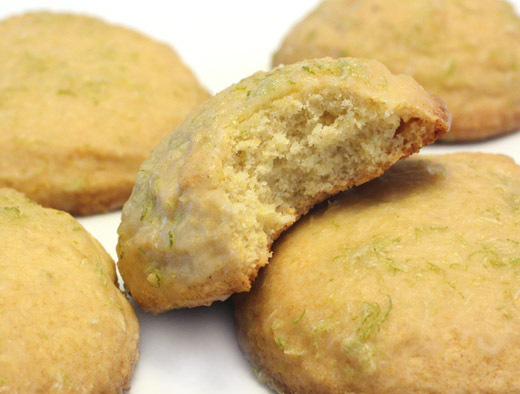 They're simple cornmeal-lime cookies, but they're different and better. That light texture and the great flavor make them the best of their kind that I've tried. I know I'll be baking these repeatedly, but first I have to find out what else there is to discover in this book. I had high hopes for this breakfast cake. With tart cranberries, sweet maple syrup, and lots of pecans, I imagined this was going to be a keeper. This is from the new book Flour by Joanne Chang, the pastry chef and owner of the two Flour Bakery and Cafes in Boston, and I received a copy to review. This was one of those books that had me turning pages and walking toward the kitchen at the same time. It's full of irresistible looking treats and informative tips in each recipe. Chang's background includes an education in applied mathematics and economics, but her love of pastries inspired an eventual career change. She worked in other restaurant kitchens, including a stint in New York with Francois Payard, and then opened her own bakery in Boston. Her philosophy is one of "simple things are best" because even complex pastries start with the basics. Hence, the name Flour for her bakery. Those simple things throughout the book range from breakfast treats to cookies, cakes, pies, and tarts, and then there are other sweets and breads. I have a feeling I'll be mentioning this book frequently around here. I've already baked two items from it, and both were very well-received. For this breakfast cake or pound cake or whatever you'd like to call it, maple pecans were made by warming pure maple syrup and toasted and chopped pecans in a saucepan. The goal was to stir the mixture and allow the pecans to absorb the syrup. 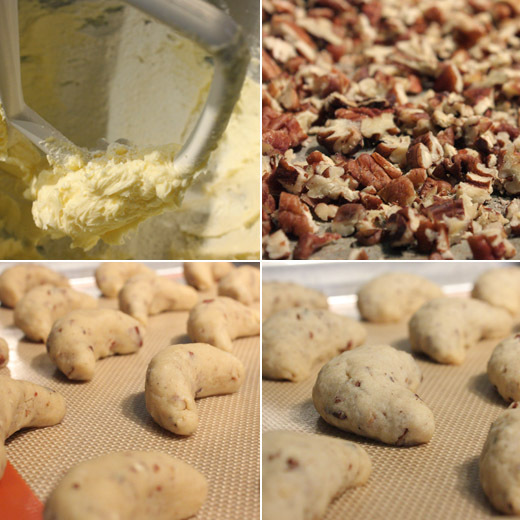 Then, the pecans were cooled while the batter was mixed. 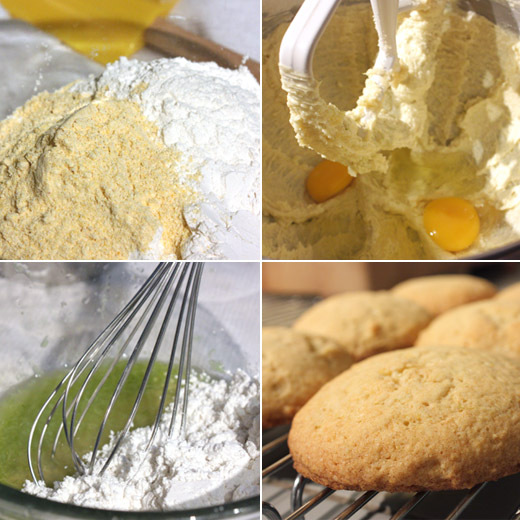 Flour, sugar, baking powder, baking soda, salt, and butter were mixed, and the instructions include the amount of time for mixing with a stand mixer and a hand-held mixer depending on what equipment you are using. I like a thorough recipe like that. Then, in a small bowl, buttermilk, eggs, vanilla, and more maple syrup were whisked together before being added to the flour mixture. The liquid ingredients were added in two parts, and again mixing times were given. 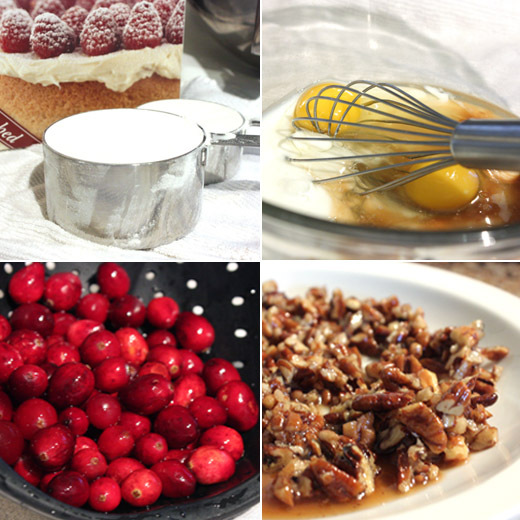 Last, fresh cranberries and the maple pecans were folded into the batter, and the batter was scraped into a parchment-lined loaf pan. It baked for just over an hour and filled the house with maple goodness all the while. 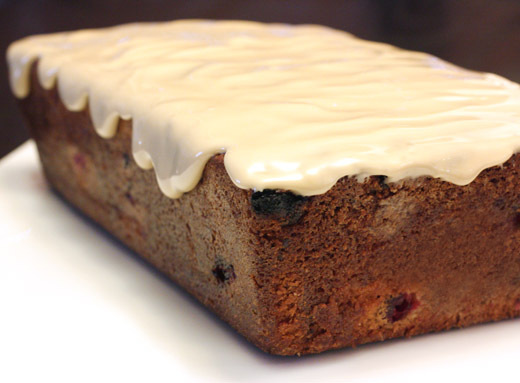 Once it cooled, the cake was removed from the pan and topped with a thick maple syrup and confectioners' sugar glaze. In the notes for this recipe, Chang writes that "the cake tastes remarkably like pancakes," and it really does. 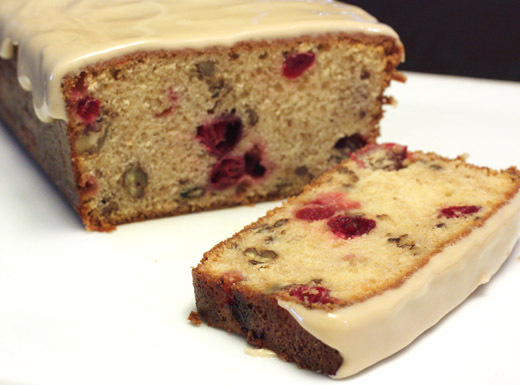 The maple flavor permeates the cake, and the pecans and cranberries accompany it well. I was so thrilled with the cake when I first tasted it, I declared it Christmas breakfast-worthy. And, if you have any left for the day after Christmas, it just gets better. Great food happens when friends cook together, and when those friends have interesting backgrounds with influences from multiple cultures, especially great food happens. Such is the case with Claudia Shaw-d’Auriol and Domenica Yang. Both are from Hong Kong and have traveled and lived in cities in the west. In their new book, Delicious , which I received to review, the two present some of their favorite dishes for first courses, mains, and desserts. The chapters are clearly organized by firsts, seconds, and thirds, and the cuisine spans the globe from east to west. That being said, this is not complicated or fussy, fusion food. In fact, this is dinner party food that will both please and impress without causing the cook undue stress. Let me give you some examples of possible menus you could build from the book: start with herbed pancakes with mascarpone and smoked salmon, followed by stuffed quail with wild rice, with a dessert of fried apples with toffee sauce, or start with mini shrimp toast, followed by caramelized pork belly, with a dessert of fruit tempura with passionfruit ice cream. As I was choosing the first item to try from the book, the Chinese turnip cakes caught my eye as did the duck breast with soba, and taglierini with caramelized scallops and rosemary beurre blanc, but in the end, I decided on the fish in lemongrass cream. In the book, this dish is called sea bass in lemongrass cream, but I found fresh and lovely-looking turbot at the fish counter at Whole Foods and went with that. 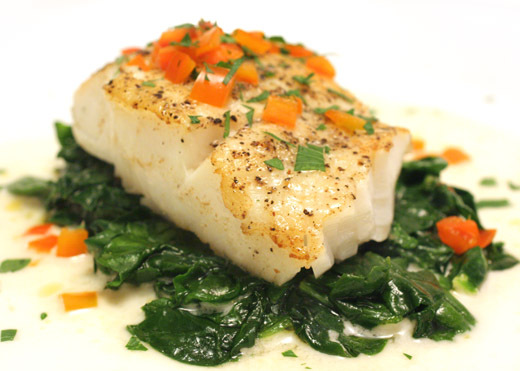 Turbot is a white-fleshed fish with a high oil content ensuring great flavor and big flakes when cooked. To begin the dish, lemongrass was steeped in fish stock. I was thrilled to use some lemongrass from my garden before the cold weather wipes it out for the season. 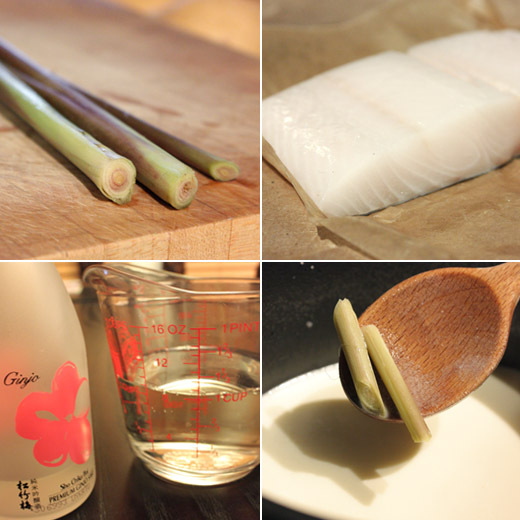 The fish stock with lemongrass was combined with a cup of sake and simmered until reduced by half. Then, cream was added and allowed to simmer to warm through. Before serving, the lemongrass was strained from the sauce. The fish was simply seasoned with salt and pepper, seared on top of the stove for a few minutes per side, and then finished in a hot oven for an additional four minutes or so. 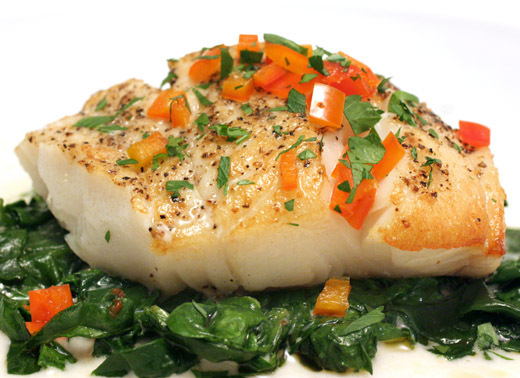 To serve, I placed the fish fillets on top of some sauteed spinach, poured the sauce over top, and garnished with chopped red chiles and parsley. I’ll come clean and admit that I really don’t know one sake from another and should take the time to gain a better appreciation of it, but I did really enjoy its flavor in the cream sauce. The simmering mellowed the sake’s alcoholic edge, and the lemongrass added citrusy, bright flavor. Of course, cream never hurts a sauce, and the mixture was as nice with the fish as it was with the spinach. I love it when I can pull together an interesting and delicious meal so easily, and this book will be a great source for more of that. When I heard about the International Holiday Cookie Recipe Exchange hosted by Adrienne at Gastroanthropology and Lori at Fake Food Free, I jumped at the chance to take part. The two organized this event in which cookie recipes were shared by email among fellow food bloggers from around the world. The recipe I received was from Astheroshe of Accro. She explained that her mother always baked these cresecent cookies for Christmas, and they were one of her favorites. She noted that they can be made with any nuts, but her mother's version always included walnuts. The recipe looked very familiar to me because my grandmother used to bake a very similar cookie in a round shape rather than a crescent, and hers were always made with pecans. I've had my grandmother's recipe tucked away for years and had never gotten around to using it. So at last, thanks to Astheroshe and by way her mother's recipe, I finally made grandma's powdered sugar pecan cookies. The recipe is a simple one starting with room temperature butter being creamed with confectioner's sugar before adding flour, salt, vanilla, a little bit of water, and finally chopped nuts. My grandma's recipe calls for twice as much sugar as Astheroshe's mother's recipe, so I split the difference. I also have a recipe for Mexican wedding cookies which are very similar, and that used even more sugar. For my taste one quarter to one half cup in the dough itself is enough. Clearly, the shape can be whatever you prefer. I followed Astheroshe's instructions to shape crescents by hand. I used a mounded tablespoon of cookie dough, rolled it into a cylinder between my hands, and then shaped that into a crescent with thinner ends and a thicker middle. The cookies have no baking soda or powder, so they don't rise or spread on the baking sheet. After they are baked and cooled, they are tossed in more confectioner's sugar for a snowy, festive look. These were as good as grandma's cookies, and they're the kind of cookie that gets better after a day or two if you're lucky enough to keep some around that long. I suppose this means I've officially started my holiday cookie baking for this year. One cookie is done, and there are, at least, a few more to go. -Cream butter until light, add confectioner's sugar and cream again. Add flour, water, and vanilla, and mix to combine. The dough will be dry. Fold in chopped nuts. 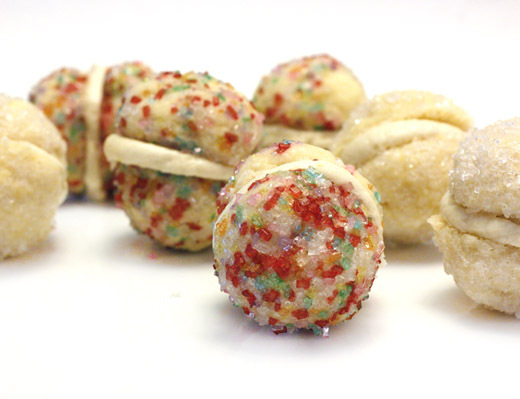 -To shape each cookie, roll a mounded tablespoon of dough between your hands to form a small cylinder. Bend cylinder and pinch ends thinner to create a crescent. 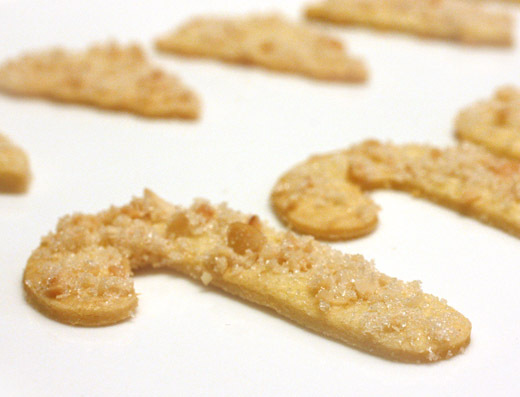 Place cookies on a parchment- or silpat-lined baking sheet and bake for 15 minutes. Let cookies cool and then roll in the additional confectioner's sugar to coat.